1. 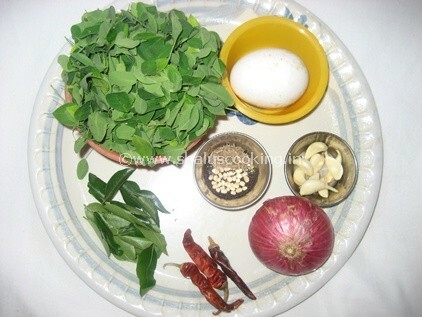 Keep all the ingredients ready to make Murungai Keerai Muttai Poriyal. a. De-stem the drumstick leaves and wash it thoroughly. b. Chop the onion and garlic. c. Break the dry red chilli into 2 piece each. 2. Heat oil in a pan and add mustard seeds, urad dal and cumin seeds. When the mustard seeds splutter, add the onion, red chilli and curry leaves. Saute till the onion turns transparent. 3. Add the drumstick leaves / murungai keerai and saute for few minutes until it starts to shrink. Add required salt and mix well. Sprinkle some water and cook till the leaves are well cooked. 4. Once the drumstick leaves are cooked, break one egg and pour into the leaves. Stir it continuously till the egg breaks and cooked properly. (The egg should have a consistency similar to that of egg bhurji). Once done switch off the flame. Murungai Keerai Muttai Poriyal is ready to serve. Serve as an accompaniment with any rice items. Helps to reduce blood sugar level. Improves blood circulation and helps in blood purification. Helps to increase the milk secretion for mothers who feed their baby. It helps in preventing Asthma.